Okay Soranik Natu’s reaction to finding out she has a son in the future with Kyle is intense. I mean she is completely over reacting to Kyle not telling her, and brands him violently with the symbol of the Sinestro Corps. What the hell?! That seems out of character right? Or has she gone crazy? I hope Kyle is okay – he is the greatest of Green Lanterns after all. In the end, John decides to announce to the the Corps that Tomar-Tu murdered a yellow lantern. While I like that John is always honest, that was probably not a good idea. Are we leading to another war with the Sinestro Corps? It’s the Superman family (sadly still missing Connor Kent and Linda Danvers) versus the Superman Revenge Squad and wow did they get their asses handed to them by the bad guys. 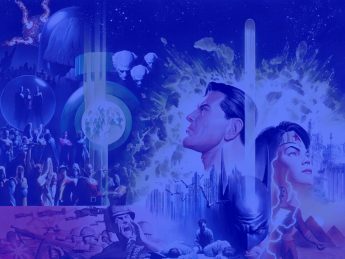 In the end, they are all sent to the Phantom Zone and it looks like Zod may have killed Lois and Jon, although I suspect they were not in that ship he blew up despite what Superman thinks I am sure Lois came up with a plan and saved them both. I enjoyed this issue and I look forward to seeing them all try to escape the Phantom Zone and what Zod is up to exactly. I was prepared to dislike this comic book. I think Greg Ruck’s run was tremendous and I was sad to see him leaving so I didn’t come into reading this with any hope but I am happy to say Shea Fontana did a good job of keeping me interested. In fact, the stuff with Hippolyta and Wonder Woman as a little girl reminds me so much of the movie that it brought a smile to my face. Wonder Woman rarely interacts with little girls or children, so it was a lot of fun to read her talking to the little girl at the wedding. The girl reminded me so much of my nieces. I also like that Fontana actually uses the supporting cast that Rucka has built up. I hope James Robinson does the same when he comes on board. I especially hope we get to see Ferdinand again. Okay this was a bare bones issue. Basically it is a big fight with the Titans and they are fighting this Mr. Binder who works for H.I.V.E. and the Flash is worried about his heart, Omen tells Tempest that someone is going to betray the team, and Donna is worried Roy will end up jealous about her new relationship with Wally. None of it seemed natural and I don’t know if it is the fault of the artist or Abnett. Speaking of Tempest, can we get his old costume back with the red and black? It just worked so much better than this current costume. I am actually not that interested in whoever betrays the team because I don’t buy any of these characters actually doing so except for maybe Bumblebee.